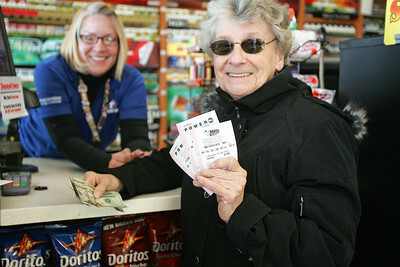 Monica Maschak - mmaschak@shawmedia.com Cary resident Betty Jankiewicz (right) holds up one Mega Millions and two Powerball tickets after purchasing them from the Thornton's gas station at the intersection of Three Oaks Road and Northwest Highway on Wednesday, November 28, 2012. The sales of tickets for the $550 million Powerball jackpot have helped to more than double business at the Cary store said General Manager Pam Selemon (left). Monica Maschak - mmaschak@shawmedia.com Lottery player Maria Zarate fills out a Powerball Play Slip at a Thornton's gas station in Cary on Wednesday, November 28, 2012. A play slip allows its players to select numbers of their choice to match the numbers drawn for the jackpot at 9:59 p.m. Wednesday night. Monica Maschak - mmaschak@shawmedia.com Danny Walentin, of Cary, waits to buy a Powerball ticket as a line forms behind him at the Cary Thornton's on Wednesday, November 28, 2012. Walentin said he would like to help Hurricane Sandy victims if he wins the $550 million jackpot. 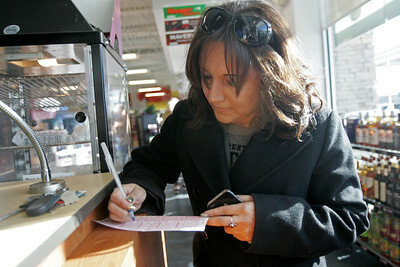 Lottery player Maria Zarate fills out a Powerball Play Slip at a Thornton's gas station in Cary on Wednesday, November 28, 2012. A play slip allows its players to select numbers of their choice to match the numbers drawn for the jackpot at 9:59 p.m. Wednesday night.